Four books in one large volume: The Way of Illumination, The Inner Life, The Soul, Whence and Whither, and The Purpose of Life. The works of Hazrat Pir-o-Murshid Inayat Khan are one of the great spiritual treasures of the world. At once deeply rooted in the Sufi tradition and strikingly original in insight and expression, Hazrat’s teachings remain as potent and meaningful today as they were when originally communicated a century ago, with a message for every human mind and heart, and indeed for humankind collectively. For some time the need for a new popular edition of Hazrat Inayat Khan’s collected works has been apparent. 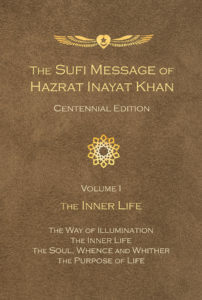 With this in view, Suluk Press now commences its series The Sufi Message of Hazrat Inayat Khan: Centennial Edition. The aim of this series is to provide the full set of Hazrat’s best-known teachings in a form that balances fidelity to his original words with sensitivity to the contemporary evolution of the English language. “The Way of Illumination” introduces readers to the principles of Hazrat Inayat Khan’s school of Sufism. An important part of “The Way of Illumination” consists of commentary on the Ten Sufi Thoughts, which summarize the essential themes of the Pir-o-Murshid’s Sufi message. “The Inner Life” explores the ways of living in both the heart and the body, maintaining the spirit of inner freedom while fulfilling life’s duties, keeping the ideal always before one and achieving balance between and within the inner and outer life. “The Soul, Whence and Whither” contains Hazrat Inayat Khan’s account of the journey of the human soul from its earliest origins to its ultimate destination. While these teachings bear an undeniable relation to traditional Sufi descriptions of life before birth and after death, Hazrat’s articulation of the soul’s journey is remarkable for the freshness and precision of its vision.